Physical Description Ethan Kessel is young, of average height. He has short, spiky Ginger/Brown hair, and sports a small thin full goatee. He is of medium Build. When he is not in uniform, he Likes to where a brown leather jacket, and Black long-sleeved Tee Shirt. General Overview Youthful, and full of Energy. Like to Joke around, and enjoys practical jokes, such as beaming sleeping crewmates to prank locations, such as a holo-deck rendition of a medieval castle dungeon for no apparent reason. Hobbies & Interests Loves to debate arguments, with a passion for Nuclear Physics. Enjoys Holo-renditions of Classical science fiction and fantasy Novels - Such as Tolkien, HG Wells, David Eddings, Jim Butcher and Terry Pratchett. Likes to spar with fellow Crewman. Enjoys Chess, and other Competitive games. Languages English Some Vulcan he picked up from a roomate. Family Has a good relationship with his father, who designs Star Fleet Ships for a living, but has few other family members h is in regular contact with. Relationships Had a lover in the past, but ended when she left him for a First officer on another ship. He Has completely gotten over it however. Friendships Has No Friends onboard, since he has recently been transferred to this new Ship. Has a Vulcan Roommate he is on Email terms with. He is in regular Contact with his Friend and Mentor, Professor Albert Rubedo who is responsible for his posting in the USS Endeavor. Personal History Was born on Titan, one of Saturn's Moons, so is no stranger to Space travel. His Mother died in childbirth, and was raised by his father. He went to school, and studied hard there, before Joining Starfleet. Education Studied Physics at New-Oxford High school, before studying At Starfleet academy. Past engineering Exams Almost Flawlessly, but did not do so well in Command, due to his lack of ability in delegating responsibly to his subordinates. Starfleet Academy During his Time at Star Fleet Academy, he established himself, as a skilled engineer, and a Competent Officer, however, he distanced himself away from situation when he had to give out order, preferring to rely on himself, and his own skill, than those of a person he knew nothing about. While at Starfleet, he made friend, found love, lost it, the usual story of any University aged Student. Having turned his sights on study Trans-Monocular theory and Nuclear Synthesis, he studied the works of Famous Nuclear Physicists, and published research on the relationship between Century old Alchemy and the Particle experiments of the modern world. Although hardly world renowned, he became a local authority with his fellow students, and enjoyed life as a well liked, well respected Engineer, who many anticipated would achieve great things in a Starfleet Laboratory, studying the Mysteries of the building blocks of Space and Time. So it was with great surprise when he announced his intention to full graduate as an officer, and serve aboard a USS Starship, in order to allow his skills directly contribute Star Fleet. Although devastated that he would rather spend time "Zooming around the Galaxy" then continue to study with him, his Lecturer and Mentor, Professor Albert Rubedo used his influence to ensure that he would eventually be posted on a ship that he considered deserving of his prodigies’ talent - The USS Endeavour - Which came to pass upon his graduation. Early Career This IS Hie early Career. His First Posting is on the USS Endeavour. 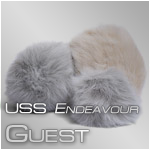 USS Endeavour Newly Transferred to the USS Endeavour, Fresh out of the Academy and eager to experience a Brand New Experience! 2370 - Ethan Kessel starts Primary school. 2375 - Ethan Kessel starts Middle school. 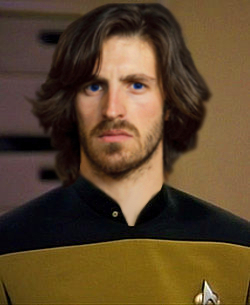 2386 - Ethan Kessel graduates from Starfleet academy and begins his assignment on the USS Endeavor. Medical History No major operations, other than a brief case of appendicitis aged 11. Allergies Has an allergy to Tribbles. Family Medical History Mother was known for having High blood pressure. Father Suffered from kidney failure, but recovered after a successful transplant.